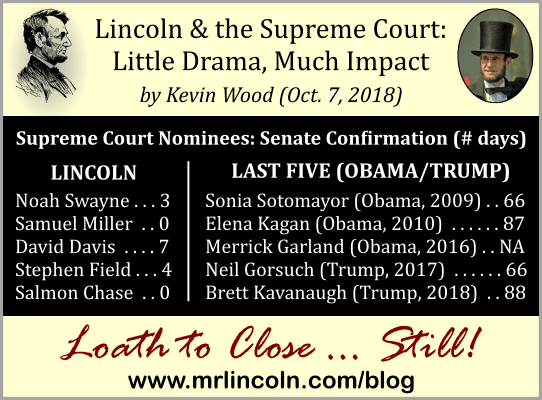 Lincoln and the Supreme Court: Little Drama, Much Impact – Loath to Close … Still! Another fantastic “report”, Kevin! I am most pleased to receive your “Loath to Close…Still” papers! What great talents you have! Kevin, may I comment on your interesting and informative article. In Craig L. Symonds book Lincoln and his Admirals, this is mentioned on page 45, and mentions that expanding the court to ten was a move by Congress to intimidate the existing court that was soon due to decide on the legality of the blockade. Do you agree with this? As you reported, a 10th justice was approved. What became of him and that 10th position? when did it go back to Nine? Hi Murray. I believe that the main reason for the expansion to ten justices in 1863 was to provide equal treatment to CA and OR. But there certainly may have been other motives. The reduction back to nine was actually first a reduction all the way to seven in 1866 as a way for Congress to block any nominations by Johnson, who had made himself very unpopular with the radicals (by vetoing the Civil Rights Act, among other things), and then, after Grant became President, an increase back to nine. These latter changes were clearly primarily for political reasons. Here’s an interesting article on this and other instances of Congress fighting with the President over the make-up of the Supreme Court: https://www.smithsonianmag.com/history/history-stolen-supreme-court-seats-180962589/. Good rainy afternoon,Mr President, Thanks for the great information concerning Supreme Court .Was wondering if you would mind sharing where you found the the information on how ‘quickly” the appointments were moved through Congress ? Thanks AGAIN and was great to spend a little DOWN TIME with you ,the other day. Hi Max & Donna. Yes, it was great to see you in Springfield last week. My main source for this info was the following Wikipedia page, although I also tried to confirm the info independently: https://en.wikipedia.org/wiki/List_of_nominations_to_the_Supreme_Court_of_the_United_States.